At 6'1 and 211 lbs Ryan is raising eyebrows among some of the best scouts in the business. It's always a question if a defencemen is worth the risk as a early 1st round pick but with todays salary cap era, finding a defencemen on your own and developing early can pay a high reward. 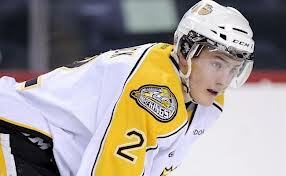 A marquee defenseman for the Wheat Kings, Ryan is projected to be an early first round selection in this year's 2013 National Hockey League Entry Draft. Considered an elite two way defenseman, he is gifted on both ends of the ice. Ryan has a NHL caliber shot that has been already recognized by the scouts. His hockey sense is through the roof. Some even have said they see Ryan as the "smartest" defenseman in his draft class. His passing is quick and accurate. All aspects of Pulock's game have made him a can't-miss prospect. 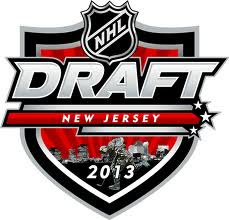 for any team in the first round this year of the 2013 NHL Entry Draft. Only question remains is how early he gets selected. Ryan tells how the speed and the size of the players, when he entered the league was difficult in the WHL as he wasn’t as big as he is now. He says it was a bit of a struggle to move guys out of the front of the net, but after putting on a few pounds it’s helped him in that area of the game. Ryan also was named captain, a honour few hockey players receive at a young age let alone defencemen. Scouts and Ryan himself all agree the strongest part of his game is his shot, and offensive ability to carry the puck. A strong worker on his physical body as well, Ryan knows it takes a strong core and strong legs to compete at the highest levels of hockey. A avid follower of hockey, Pulock like to follow Keith Yandle because of his puck moving ability and being consistent in the defensive zone. Sounds like another player the Oilers may have interest in on defence should he be available when it comes their turn to make a selection at this summers entry draft. It's actually fans and bloggers and posters on message boards that DON'T like the Oilers. They seem furious, outraged and love to find every fault they can to speak badly of the Edmonton Oilers. Has our team let us down? Yup! Do they deserve criticism? Yup! To the extreme that it is? I say no! However, with becoming the new darling of the NHL, the Oilers will face incredible scrutiny night after night, so get ready Oil Country cause it will not be stopping anytime soon. Why are people so angry that the Oilers are getting 1st OV draft picks? Those same people will tell you those #1 OV players are not that good. Then why complain, cause obviously Edmonton picked wrong or they were weak drafts. If Edmonton picked not great players, that means another team got them right? Makes sense. The real reason people are furious about our last place finishes and so many in a row IS because we are STOCKED with Elite skill now. It's called jealousy, that's all. Actually Oil Country should be honoured to have people trash talking us, it's about time we got some attention. Those same people complaining are most likely the same people who kept saying no one wanted to play in Edmonton. My how times have changed. It happens, it's called rebuilding. Now back to my reason for this blog. Do the Oilers deserve to be highly critiqued? Absolutely! We have enough elite talent minus a #1 consistent Goalie and a legit #1 or #2 Defencemen. It will take chemistry, hard work, good coaching and excellent managing to take this team to another level. Can it happen? I believe it can but it is a work in progress. As much as my stomach was sick watching that 1st period in Game 2 against the Sharks, I know it is still only the second game of the year and home opener with lots of young talent still learning and growing. You don't build a great team overnight. Edmonton showed us in the 2nd and 3rd periods, they can play better. I know people are saying the only reason it was closer was because for 2 periods the Sharks let go of the gas? Really? How about the only reason this game was out of reach early was because the Oilers didn't put their foot on the gas for 20 minutes? You can't have one criticism without the other. They go hand and foot together. Last time I looked it takes 60 minutes to complete a game. So, you can't sell me on the only reason they were reasonably closer was because the Sharks couldn't keep playing hard because they were so far ahead in the score. I have seen Edmonton dominate a team for 50 minutes and fall by 3 goals to actually lose a game. Fans and media alike go on how awesome they played but fell short by 10 minutes. My take is, maybe the other team played well? Enough of my random thoughts on the Oilers to date. Let's grab that drink, get behind the ol' TV (Or Rexall for some) and watch some more Oiler hockey. I have a feeling we will see a far different team today after being embarrassed on Tuesday. 1) What has been your impressions of Kruger's Training Camp this year? I have been extremely impressed with the work of Ralph's practices that I witnessed during the three practice days. The fast paced and prepared work the players knew beforehand seems to have been well executed at most times. Of course it will be a work in progress as the season carries on. In years past the players would appear sometimes confused with some of the drills required but Ralph appears to be keeping it simple. I like what I have seen and what I am hearing from the players but only time will tell. 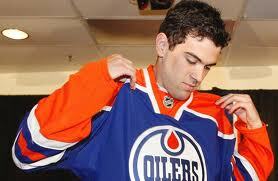 2) Do you think Whitney should have lost the A to Nick Schultz or do you think it is a mistake that the Oilers made? In defence of Ryan, it can be a hard pill to swallow and it could even be a way of showing Ryan that the club expects more focus on his health and his game then on responsibility. Also picking a letter to go on a player who is actually playing and not injured most times can be helpful. Nick is underrated with how mature he is in the locker room and outside of it. A veteran of the game, I think he is a good pick for a letter but do find it curious to give it to him so early in his Oiler tenure. When trade deadline comes about, does this have a affect on which defencemen is dealt , should one be dealt? It is anyone's guess and I really am only thinking out loud. 3) Do you feel Hemsky should be on LW and not Yakupov? I know some of you are up in arms and think Ralph is out to lunch putting Yakupov on the LW and keeping Hemmmer on the RW. Many have called for Yakupov to start on the RW to gain the greatest benefit coming out of the gates. Problem is, Yakupov is more adaptive then a more aged mature veteran in switching roles. Not to mention with Yakupov been a LH player it allows him better ability in the defensive zone to move the puck out then on his back hand. With both Hemsky and Yakupov, being two players who move east/west across the ice at top end speeds they just have to develop the chemistry in such a way that they can read off each other in the offensive zone. When back behind their blue, Yakupov will be placed on his strong side to transition that puck out easier though. I like the move and in practice Yakupov looked to be moving with no concerns. They look good, just need to have some time to build good chemistry. 4) What is your opinion on what the Oilers have done to say 'sorry' to the fans this far? I liked the outdoor shinny game, I like the open practice and I like the free popcorn and pop. What I did not like? Only a couple hours notice for shinny game to go see. How does that benefit most fans if they don't even know. The Oilers staged this in advance and most fans think it was Hall and Eberle planning a last minute shinny game. Sorry folks, it was well planned and organized. Good on the players and organization but more planning was needing to let fans know or at least video the game for streaming or something simple. The Open Practice? Well I have attended training camp practice for years and for the Oilers to make it a big deal that they opened it up, like it was special? Well that to me is misleading. In the end it ended up being free popcorn and pop and because it was offered i saw how many kids actually showed up at the practice and took advantage of that. I liked that part cause it brought the players and game closer to the younger generation but in the end, I hope that is not it, and there is more to come. To me, it is not about how much they give away free, it's about how close fans can feel to their team. Only time will tell, cause we know the Oilers do not have to do anything and in the big picture it really would not matter much. 5) With the NHL Draft Entry players rankings having changed some since September and if the Oilers finish just outside the playoffs , who do you think is likely for the Oilers to pick? Well, for starters I am estimating the Oilers could at maximum surprise and make the playoffs in a 7th-8th place finish but likely the 8th place eastern team will have more overall points. That would mean the Oilers would at worst pick at #15 or better. On the bad side, let's say they have injuries and the rookies struggle and RNH does as well, your looking at a 12th place finish in the west. So the highest the Oilers would likely pick would be #5. Having placed the high end and the low end, it would mean the Oilers would be selecting anywhere between 5th-15th Overall. Picking at a draft is always difficult further down because you never know which players you like get picked up early. According to my 'REVS Top 15 NHL Entry Draft Prospect Rankings', I will place in order from most likely if they picked early.Should they place further up in the standings obviously the higher players may be gone. You may notice their seems to be a method to the madness and maybe a organizational need? Center and Defence? Also no one under 6'0 tall. 6) Is #64 more likely to eventually take #10 in the future when Horcoff retires or when he leaves the organization? 7) What are your Realistic Expectations for Yakupov this year in goals? I believe Yakupov has the potential to be a 1.25 PPG player in his future but coming out of the gates he will not produce like that. I am going to estimate him at a .65 PPG player on this Young Oiler team as he has lots of possibilities to rack up points with second unit PP and second line playing time. Let's say he plays 45 of the 48 games, that would give him approx 29 points in a shortened season. 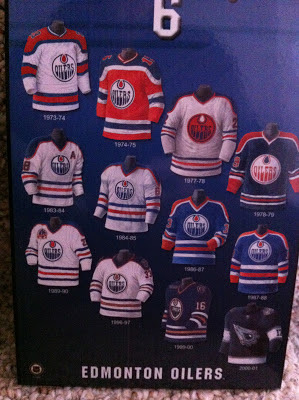 8) Before the season begins on January 20/13, could you give us your predictions in what place the Oilers will finish? As mentioned in a earlier question above, I expect the best and the worst the Oilers could do is finish anywhere from 7th to 12th in the Western Conference. I am going to actually go on a limb and say the Oilers grab 8th place for the last playoff spot.I know, drinking the kool-aid. Call it a hunch, call it being a fanatical follower but too many things could be working for the Oilers this year to not make it real close. On twitter right now, Oilers hotshots Jordan Eberle and Taylor Hall are talking trash about setting up a shinny game for 4pm today at Hawrelak park. I can only Imagine this will draw a fairly large crowd. They have mentioned names like Nail Yakupov, Ryan Whitney, Nugent-Hopkins and newcomer Justin Schultz participating. We can only imagine most of the team showing up to play in this "unorganized" pick up game. So if your not busy today around 4pm, head down to Hawrelak park and snap some photos. Your going to experience what hockey is all about. Just pure, fun hockey. Wish I could be there. The Curious Case of "JUSTIN SCHULTZ"
Endless arguments (or should I say debates?) have taken place on twitter, Facebook, blog sites and throughout message boards not to mention on the streets in Edmonton. The main disagreement is Justin's potential point total and or defensive game in the NHL and how well his career to date will translate from AHL now to the NHL. People are curious as to the answer to these questions. Some are looking at him as a superstar, others say it's Oiler fans being biased to their own players. Some people believe that the defensive prospects of the past translating their game to the NHL is slim to none within the first year. 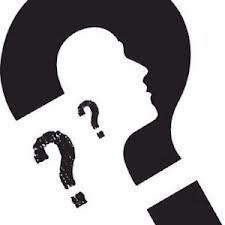 I have been asked for my thoughts quite often and have taken heat for my answers (or should I say my opinions). Instead of trying to explain my reasoning with limits on twitter and in a typical text or on Facebook, I thought I would go ahead and just openly expose my reasons behind my crazy thinking here at Oilers Jambalaya. Justin began his Jr career playing in the BCHL and while his first season was good, it was not instant super stardom. He did however record 40 points in a 57 game schedule. Not too shabby for such a young player but nonetheless was named the Top Defenseman of his conference in the BCHL, which is no small feat for a 17-year-old. His sophomore season showed a growth curve and now he started being taken notice of by scouts everywhere. With 50 points (10 points more then previous season) but in 49 games only (8 less games played then previous year) Justin was showing the hockey world his offensive upside and a good understanding on growth in his defensive game. Once again he was named Top Defensemen, not bad feat that seldom achieve. In Justin's 1st season playing on a University of Wisconsin defense, (considered one of the deepest in the country) he was able to step in as a freshman and make a contribution. In 43 games played he was able to record 22 points as a freshman. Few freshman have the ability to make the impact that Justin was able to. While his 1st year in Wisconsin was a continued growth curve for Schultz, it was just the beginning of greater things to come. He was named to the All-Rookie team, a achievement that is worth noting to skeptics of his game. In his sophomore year for the Badgers he scored 47 points in 41 games and was +16 with 28 PMs; Schultz was later named the WCHA Defensive Player of the Year and was named to the WCHA and NCAA West First all-star teams. Was also a finalist for the "Hobey Baker Award" as NCAA Top Collegiate Player. Justin continuing to improve his game at all levels and in his 3rd year at Wisconsin, had 44 points in 37 games and on a team that was now struggling to even be at .500. Once again Justin was named the WCHA Defensive Player of the year. In addition he was chosen on the WCHA first all-star team and the (West) First All-American Team. 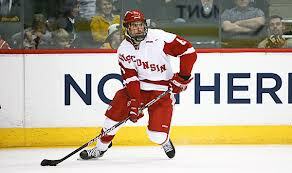 Once again he was a finalist for the "Hobey Baker Award" as NCAA Top Collegiate Player. 2 years running for this award is seldom done for a forward let alone a defensemen. Schultz had showed the hockey world that he was a player who not only could play hockey but had the ability to mature and continue to show he has the ability to keep growing in his position. Having now been sought out as a UFA in the summer of 2012, Justin choose to pick the Edmonton Oilers as his best opportunity to begin his NHL Career with. 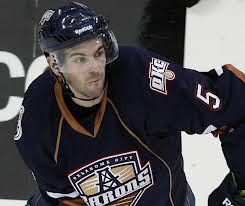 With the lockout actually coming into fruition Justin Schultz was assigned as a ELC player to the AHL farm team in OKC. Away from the incredible pressure that would be on him in training camp and the huge jump from the WCHA to the NHL, it looked like a blessing in disguise. Now suiting up at the minor pro level would afford him some time to adjust to the pro game of hockey at the second highest level. In 34 games he was able to register 48 points. Few expected Schultz to perform at a PPG let alone above a PPG but Justin had once again risen to the occasion and really attached his skillset and on ice IQ to the minor pro level in the AHL. His awards for player of the week, player of the month etc..were no small feat especially for a defensemen. Being only second to Eberle (a established NHL'er ) and producing his point totals has been a unreal sight to see. He was on pace to break several records and be in many of the AHL records for the future before getting the recall to Edmonton with the lockout ending. Back now in Edmonton and skating with the Edmonton Oilers for the first time, has the city and the NHL world discussing the potential he has in his point production (especially based on his AHL numbers) and his ability to handle the big boys of the game with years of NHL experience. To date, all we can say is he continually shows that upward curve and at the very minimum he should be able to handle PP time and 3rd pairing duty. In OKC he was logging 24-30 minutes a night, so not sure exactly how his play would handle the lack of ice time. Only time will truly tell. 3) To excel in the AHL like Justin did is almost unthinkable for any player let alone a defensive first year rookie. 4) Justin is not just any Rookie entering the NHL but a older more experienced rookie. 5) Has been given rave reviews of his Hockey IQ by his NHL talent teammates Taylor Hall, Jordon Eberle and Ryan Nugent-Hopkins. I could also mention AHL players but figured you would give more strength to NHL'ers then AHL'ers. 6) OKC Coach Todd Nelson believes in Schultz's ability and even defends his defensive ability as being under appreciated. In case your just saying, he is just his coach, they always talk like that. In the case of Coach Nelson, if you listen to his interviews he is very frank and speaks his mind quite easily. He surprisingly will be quite honest about his opinions to break down and critique a player with no hesitation. In the case of Schultz, he only states on occasion he makes a rookie mistake but is extremely teachable and adapts the coaching into the next game. 7) Comparing Schultz's point production to past AHL success of other high point producers who never even made the NHL is pretty weak. Did those aforementioned players, people are thinking of show incredible accolades and achievements going into the AHL as well? Did they produce like him in their rookie season? Were they Defensemen? All these questions are important in looking at those comparisons. 8) Like RNH who showed a continuous upward growth curve in his elite level hockey IQ and skill, Schultz has done much the same but through a different path. 9) Some of the same arguments people made about RNH being to small have been made about Schultz, especially playing defense. As Whitney has said in interviews, it isn't always the physical ability to crush a opponent but the ability to have a good stick and hockey sense. Not sure if it was Hall or Eberle in one of their interviews but they stated skill players getting around Justin seldom find success. The difficulty that Justin has, is with the big rugged and tough forecheckers. 10) This player was probably the 3rd most sought after free agent on the market in 2012. Why? Cause every team saw something incredible in his talent. Ask any scout, amateur or pro and they will tell you the same, the sky is the limit for this guy. People who get paid to critique in the NHL with hockey players speak the same language and over 75% agree on the upside of Schultz. The only question that really remains is can Justin Schultz step right in and produce or will he need a year or two to develop and mature into the NHL game. From all the stats, the hockey IQ of this player and from those close to him, I say yes, he is ready now. Highly doubt he can produce a PPG but .6 PPG is a possibility IMO. It's a Curious case, that's for sure! Only Justin Schultz can really answer that question but the hockey world is only a week away from seeing the answers beginning to unfold. Edmonton, home of 'Next Hockey Phenom'?